VISSCHER -Europa delineata et recens edita. VISSCHER, N. - Europa delineata et recens edita. Europa delineata et recens edita. 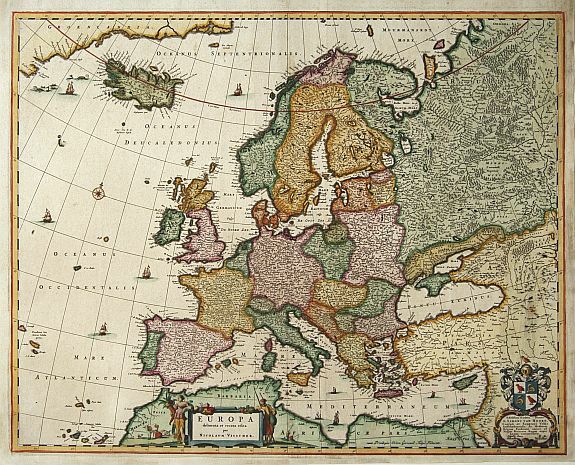 - VISSCHER, N.
Title : Europa delineata et recens edita.. Size : 17.1 x 21.3 inches. / 43.5 x 54.0 cm. Description :"Among the many great Dutch map publishers active in the seventeenth century were the Visscher family, begun by Claes Jansz Visscher (1587-1652) and continued by his son Nicolaas (1618-1679), grandson Nicolaas II (1649-1702) and then by his grandson's widow, Elizabeth until her death in 1726. Although mainly art dealers, the Visscher's were prolific publishers, producing individual maps and also atlases made up to their customer's specifications. They are commonly regarded as second only to the Blaeu's among Dutch map-makers for the high quality of engraving and decoration and the geographical accuracy of their many maps. This map of Europe is particularly attractive; finely engraved with discreet decorative sailing ships, monsters and compass roses adorning the seas. In the lower right hand corner of the map a dedication to Simoni Van Hoorn of Amsterdam is shown complete with family arms." Condition : Margins cut close, re-margined. Repair of split lower part center fold. Lower right hand corner (2x15cm) paper re-inforced and image carefully re-drawn. Restorations are hardly notable.